Don't Get Left Behind...Get Certified! are being accepted until April 30, 2019. Be a Certification Trailblazer and Apply Today! Enhance Your Professional Knowledge with AHIA’s Virtual Learning Library! Now Available for Subscription Purchases! 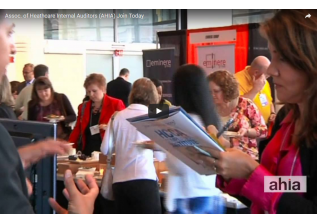 It is more than just a website – it’s a professional networking and business information tool designed to connect members of AHIA on a whole new level. rewards for each member your recruit! Access E-News for the latest fraud headlines & practice news. Discover benefits and learn to renew & change your records. Founded in 1981, the Association of Healthcare Internal Auditors (AHIA) is a network of experienced healthcare internal auditing professionals who come together to share tools, knowledge and insight on how to assess and evaluate risk within a complex and dynamic healthcare environment. AHIA is an advocate for the profession, continuing to elevate and champion the strategic importance of healthcare internal auditors with executive management and the Board. If you have a stake in healthcare governance, risk management and internal controls, AHIA is your one-stop resource. Explore our website for more information. If you are not a member, please join our network. Learn more about AHIA benefits in our Excellence Through Sharing Video. Explore AHIA's Educational Opportunities and Events. AuditNet Premium Content, Forums, Whitepapers, Surveys are available to our members. AHIA helps connect job seekers and employers. "I have appreciated the willingness of the AHIA members to unselfishly share their talents among each other." "AHIA = An engaging and knowledgeable group of people with whom I am grateful to associate." "AHIA always gives me quick responses to questions raised." "I always turn to AHIA for reliable information on current, pressing issues in healthcare auditing." "My AHIA membership is an overall great value; number of CPE credits available; good practical knowledge offered; not all theory." "I count on AHIA for very topical and informative presentations and great speakers." "What I value most about AHIA are the excellent reference materials and networking opportunities." "AHIA offers me outstanding variation of presentation topics." "The group is small enough that each individual can actively participate and share real world experiences, successes & challenges." "AHIA has started an important conversation about EMR/EHR risks and controls." "AHIA's Annual Conference gives practical info and selection. It is the only CPE offering that I attend where I walk away with things I can institute the next day." "AHIA is relevant to today's priorities." "Healthcare internal auditors have limited resources, so the opportunity to network with and learn from other AHIA members is invaluable." "I attended my first AHIA conference in the early 1990s. An outstanding professional venue providing a solid foundation which has positively impacted my career." "I have found AHIA to be a valuable piece to my professional development over the last several years." "AHIA's mission is important to raising the awareness of the importance of our role as internal auditors in the healthcare industry." "In my 20 plus years in healthcare internal audit, I have derived great value from my AHIA membership." "I always encourage my professional audit staff to attend and participate actively in the various programs and conferences offered by AHIA." "AHIA has been extremely valuable to me in my years as a healthcare internal auditor." "AHIA gives me the overall ability to network with a wide range of dedicated healthcare internal auditors and compliance officers throughout the country." "My involvement over the years with AHIA has been very rewarding and has offered a great opportunity within our profession to share ideas, practices and camaraderie." "I have found AHIA to be a suburb professional association." "I have benefited from AHIA in many ways; receiving advanced training in emerging risk/ control areas and establishing lifelong professional relationships." "AHIA is integral its ability to convey best practices to healthcare internal auditors." "AHIA creates a stronger voice for internal auditors in the healthcare industry and should be recognized as the premier resource on healthcare internal audit issues." "AHIA well serves the professional educational needs of healthcare auditors, promotes sharing of information and ideas related to healthcare internal auditing." "AHIA, the audit library and New Perspectives are my primary sources of information when starting a new audit. I value AHIA for the information it provides. "